Hello, January! The holidays really flew by this year, and due to a combination of the late Thanksgiving, my husband's work travel, a week of the flu, and spending Christmas with my in-laws, I didn't get to experience many of my usual holiday traditions this year. C'est la vie. Gingerbread cookies are one of my favorites that I missed out on, so I decided to incorporate the sweet ginger flavor into a dessert for New Year's Eve. I know we're all thinking we should be strictly dieting this month. But does that ever really work? I feel like trying to make huge changes during the dead of winter is really unnatural. Who could successfully give up gluten when it's below freezing outside? Which is why this year I'm striving for balance. So I'll drink a fresh green juice, and then eat one of these cakes. Fair enough? Gingerbread Cake: Adapted from Bon Appétit - follow the cake recipe, but instead of a large cake pan, pour the batter into sprayed & floured cupcakes pans. I also doubled the ginger (fresh & powdered) and cinnamon. Makes 11 mini cakes. I didn't make the lemon topping Bon Appétit suggested, instead I made the ganache and whipped cream (below). Chocolate Ganache: 8oz dark chocolate (chopped or chips), 1/2 cup heavy cream, 1/4 teaspoon kosher salt, 1 teaspoon vanilla extract. Place all ingredients in a double boiler, or a bowl on top of a pot of boiling water, making sure the bowl doesn't touch the water. The idea is to heat and melt the ingredients, not to cook them. Stir until incorporated. You can learn more about ganache and watch a video on The Joy of Baking. 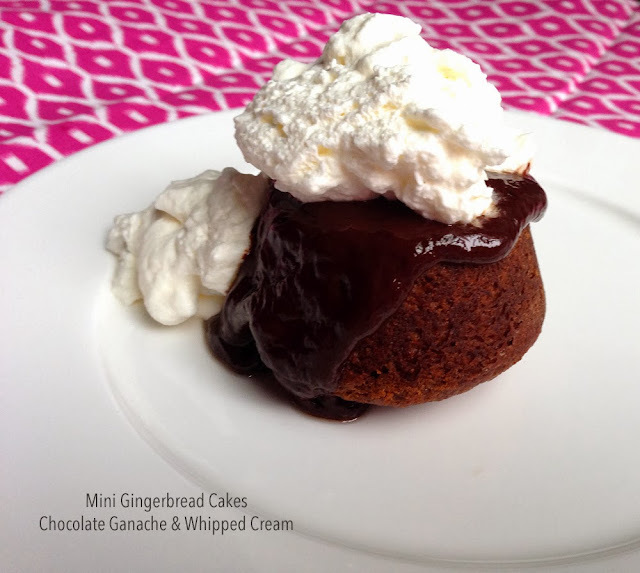 Whipped Cream: Whisk 1 cup heavy cream with 1/4 cup confectioners sugar, until it reaches a soft peak. You can use less or more sugar depending on how sweet you like it. Each element can be made ahead and quickly assembled when you're ready, so this is a great option for a dinner party. The ganache will harden slightly at room temp and can be reheated to serve.